Taqueria Diana is known for its overstuffed Mission-style burritos, tacos, nachos and salads. Started in the East Village by Matthew La Rue, a San Francisco transplant, Taqueria Diana now has several locations in the city including Williamsburg, Hell's Kitchen and the Lower East Side. Tacos are made from scratch with masa sourced daily from Tortilleria Nixtamal in Corona, Queens. They come with a variety of fillings including Al Pastor and vegetarian options like rajas made with roasted Poblano peppers and corn. 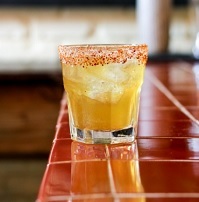 The Williamsburg location also offers cocktails like the Diana Paloma (Pueblo Viejo Blanco, Campari, Lime, Agave, Grapefruit Jarritos) and a Spicy Margarita. UPDATE: Taqueria Diana is now offering a new specialty breakfast burrito – available every Saturday and Sunday at the Williamsburg outpost. The breakfast burrito is packed with eggs, beans, Monterey jack cheese, guacamole, and housemade hot sauce in a freshly made flour tortilla for $8, with the option to add chorizo or bacon for an additional $3.